There are challenges that come with running the last Blockbuster Video on the planet. The computer system must be rebooted using floppy disks that only the general manager — a solid member of Gen X — knows how to use. The dot-matrix printer broke, so employees write out membership cards by hand. And the store's business transactions are backed up on a reel-to-reel tape that can't be replaced because Radio Shack went out of business. Yet none of that has kept this humble franchise in an Oregon strip mall from thriving as the advent of on-demand movie streaming laid waste all around it. When a Blockbuster in Australia shuts its doors for the last time on March 31, the Bend store will be the only one left on Earth. "It's pure stubbornness, for one. We didn't want to give in," said general manager Sandi Harding, who has worked at the franchise for 15 years and receives a lot of the credit for keeping it alive well past its expiration date. "We did everything we could to cut costs and keep ourselves relevant." The store was once one of five Blockbusters owned by the same couple, Ken and Debbie Tisher, in three central Oregon towns. But by last year, the Bend franchise was the last local Blockbuster standing. The Bend store had eight years under its belt as a local video store before it converted to a Blockbuster in 2000, a time when this high desert city was still a sleepy community with a small-town feel to match. Customers kept coming back, drawn by special touches like staff recommendations, a "wish list" for videos to add to the rental selection and even home delivery for a few special customers who couldn't drive in. Dozens of local teens have worked there over the years. Then, in 2010, Blockbuster declared bankruptcy, and by 2014, all corporate-owned stores had shuttered. That left locally owned franchises to fend for themselves, and one by one, they closed. 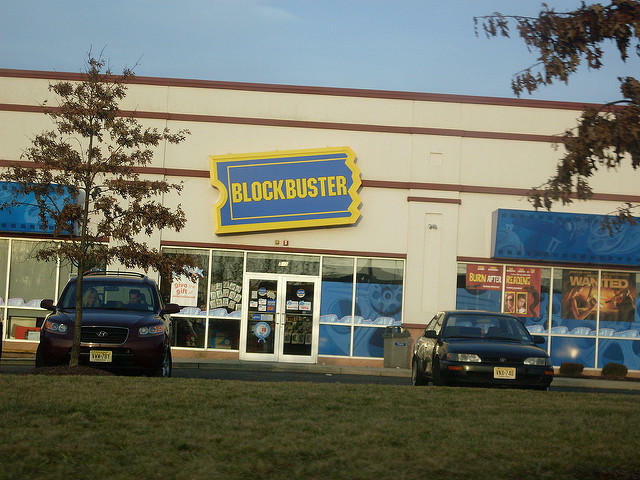 When stores in Anchorage and Fairbanks, Alaska, shut down last summer — barely outlasting a Redmond, Oregon, store — Bend's Blockbuster was the only U.S. location left. Tourists started stopping by to snap selfies, and business picked up. Harding ordered up blue-and-yellow sweat shirts, T-shirts, cups, magnets, bumper stickers, hats and stocking caps from local vendors emblazoned with the words "The Last Blockbuster in America," and they flew off the shelves. On a recent weekday, Michael Trovato of Melbourne, Australia, stopped by while visiting his twin sister in Bend. After posing for a photo, Trovato said he misses a time when choosing a movie meant browsing hundreds of titles and asking a video clerk for insight instead of letting a movie-streaming service recommend one for him based on a computer algorithm. The Bend store doesn't seem to be in danger of closing anytime soon. Its newfound fame has been a shot in the arm, and customers stream in to buy $40 sweat shirts, $20 T-shirts and even $15 yellow-and-blue beanies hand-knit by Harding herself. The store pays Dish Network for the right to use the Blockbuster logo and has several years left on its lease. People regularly send the store boxes of old VHS tapes and DVDs. They also donate Blockbuster memorabilia: a corporate jean jacket, key chains and old membership cards. Employees always send a thank-you note, store manager Dan Montgomery said. Jerry Gilless and his wife, Elizabeth, brought their two kids, John, 3, and Ellen, 5, and watched with a smile as the siblings bounced from row to row, grabbing "Peter Pan" and "The Lion King" and surveying dinosaur cartoons. "How could we not stop? It's the last one," said Gilless, of their detour to the store while on vacation from Memphis, Tennessee. "They need to see that not everything's on the iPad."